Most of the businesses has got incorporated in the form of LLP in last years due to its having benefit of both company and partnership firm. 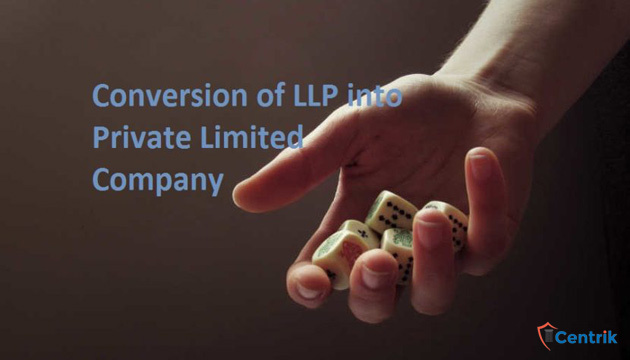 But now LLP’s are looking to get the status of Private limited Company. The reason why LLP’s are aggressively willing to convert to a private limited, is the growth prospect or infusion of equity capital. Section 366 of Companies Act, 2013 deal with provisions for Companies authorised to register under this Act. The said section provides that any partnership firm, LLP, cooperative society, or any other business entity formed under any other law consisting of “two or more” members (substituted by companies (amendment) Act 2017 for the words “seven or more”) , may at any time register under the Companies Act, 2013 as an unlimited Company or Company limited by shares or a company limited by guarantee. Consent of partners and the secured creditors shall be required for the proposed conversion. A notice for any objection for the proposed conversion is to be given in news Papers in one English and one in vernacular language. Before going further, an application for name approval of the proposed company shall be file with Ministry. E-Form URC – 1 is the form prescribed to register company u/s 366 of the companies Act 2013. Consent of the proposed directors. An affidavit stating that the member is qualified for directorship and not disqualified u/s section 164. List of all the members of the proposed company along with their shareholding details. A list of the partners in the limited liability partnership firm. LLP Agreement with the Certificate of Registration. NOC by the secured creditors. Written consent of the members of the LLP. A duly notarized affidavit from all the partners of the LLP towards the dissolution of the the Partnership firm. Certificate by a practicing CA/ CS / CMA currently in practice certifying the compliance of all the requisite provisions. The company is required to file incorporation form, as linked forms along with e form URC – 1. The attachments in these forms are same as required while filing application of incorporation of normal companies. Please note that the object of the proposed company shall include the object of conversion of the LLP into Private Limited Company. The Registrar of Companies will issue a Certificate of Incorporation if it found all documents in order.